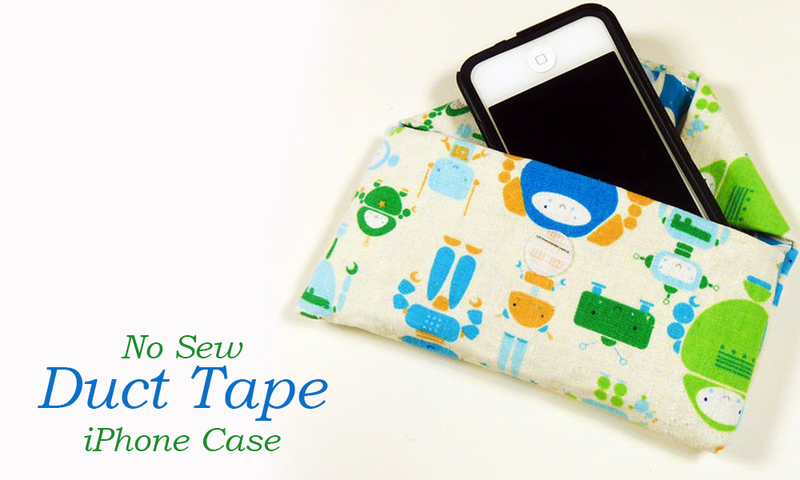 Inspired by the popularity of the No-Sew Duct Tape Wallet and the No-Sew Duct Tape Zipper Pouch, I decided to create a No-Sew Duct Tape iPhone Case! Of course, you can modify this style to fit any phone, or use it for something else entirely. This version is the simplest of them all, and a great introduction to the rest of the series! Begin by placing strips of duct tape along the back side of the fabric. Slightly overlap the strips of tape. Peel the fabric off the table and trim off the excess tape around the edges. Place a strip of tape across the two short edges on the right side of the fabric. Turn the fabric over so the taped side is facing up. Fold the short edges over so and tape down so that a little bit of the fabric shows on each edge. Measure the pocket for your case by wrapping the fabric around your phone as in picture 1, making sure the fabric sides are facing each other ("right sides together"). Staple along both sides of the pouch along the full length of tape, as in pictures 2 and 3. Place a piece of tape along the entire length of the sides you just stapled, making sure the fabric is facing you. Fold the taped edges over along the staple line so you are folding back about 1/2" of the fabric, and tape down. Either trim the edges of the tape and skip to step 7 or fold under the bottom tape to the other side, and leave the tape at the top long for an envelope finish, and proceed to step 6. Fold the two edges towards the middle. Roll the remaining tape under the flaps, so it works sort of like double sided tape. Press down corners to adhere. Turn the whole thing right side out. Use the point of your scissors to help poke out the corners. If you like, add sticky velcro tabs for closure. I've found the sticky tabs adhere really well to the duct tape side, but need to be stapled down to the fabric side. You're done! Wasn't that fun?